i will take balvenie (too many good ones to name) and jameson (reg , 12yr, 18yr, black barrel, gold) most anytime over anything. Yeah, love the Balvenie ones. Mmm hmmm, tasty stuff that Doublewood. Believe I'll be breaking some out this evening, matter of fact! Ah geez, and here I thought I was done Christmas shopping! You can keep yer Scotch. I won't turn down the Jameson, but Red Breast is where it's at for Irish Whiskey. You can pour out the Bushmills. Yeah, Bushmill's is overrated and Red Breast is pretty tip top for Irish. I'd bet you'd like the Doublewood - all malt but not peaty, aged in bourbon barrels then in sherry barrels. It's a damn fine whisky - my bourbon drinking friends like it. FWIW, I like good bourbon, too. I'm a big Four Roses fan, among others. Friend of mine brought me a bottle of willett pot still reserve. First time having it and enjoyed. I've seen the Town Branch bottles in various stores, but haven't picked one up. The reviews have been mixed is why I've passed it up. Try it for yourself. I find reviews foolish in most cases. It's not a popularity contest, it's whiskey!. 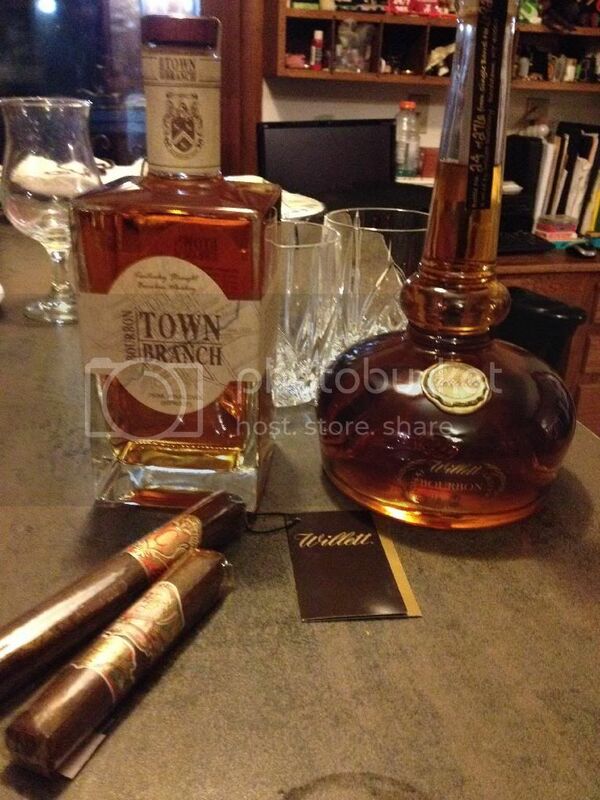 We just got Town Branch here, and that will be my next purchase along with Green Spot. Need that for next week. Loving Four Roses Single Barrel. Four Roses Single Barrel is what I have ben keeping stocked at the house lately. Agree, good stuff. I can't get the Town Branch here but I think I would prefer that over the Four Roses Single Barrel, especially since it's a good bit cheaper. I've been enjoying Jim Beam Rye a lot lately as a less expensive drop. I think that is a really, really nice Rye for the price. high praise. I will pick that up tomorrow. Glad to hear someone else likes Jim Beam Rye. It's pretty good good stuff, although it's been a while since I've had it. In case anyone wants to adulterate some Bourbon with Ginger I suggest you give Old Ballycaster a whirl. Nice and spicy and it only takes a splash. I'm really enjoying the Town Branch Rye. So jealous of you guys in Indiana and Kentucky. Hard to get much beyond the big brands here. And I find the so-called Texas bourbons a bit rough, although Garrison Brothers can be nice on occasion.